For 5 years Greenpicks espouses for using plastic-free alternatives. For our 5th birthday* we start a cup to go raffle for everyone who likes to drink coffee or tea on the way. The shop promavis donates a coffee and tea to go glass cup with a reversible neoprene sleeve. Never again disposable cups for coffee or tea! Enjoy hot drinks on the go and refill again and again? Get a refillable glass cup including a tea strainer and a neoprene sleeve from Dora. 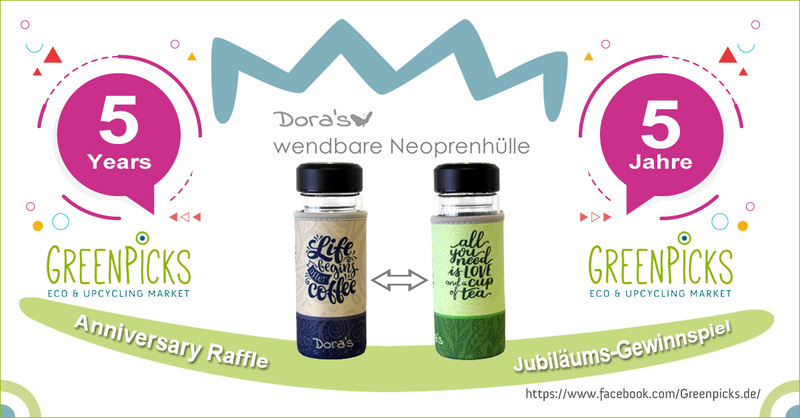 The raffle takes place at Greenpicks via Facebook https://www.facebook.com/Greenpicks.de. How to participate, you will find in the respective post. You will receive your prize directly from promavis. No cash withdrawal of prizes (value of 18.75 Euro). Previous Post5 Years Greenpicks! – Eco Raffle!Next PostSanta Claus raffle: win 3x eco toothbrush sets!